The nursery is a child’s magic realm. You want to furnish it with a crib that’ll tug at your heartstring and transport you to yesteryear. 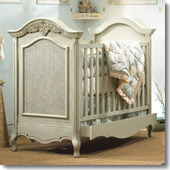 You want handcraftsmanship; you want distressed finishes and elegant carvings; you want an heirloom baby crib.